With the launch of two career institutes, Dallas ISD is expanding career options for highly motivated students who want to enter the construction trades and earn a living wage right out of high school. The institutes will launch in August to offer courses leading to certificates in construction, plumbing, electrical, and heating and air conditioning at locations in North Dallas and Oak Cliff. 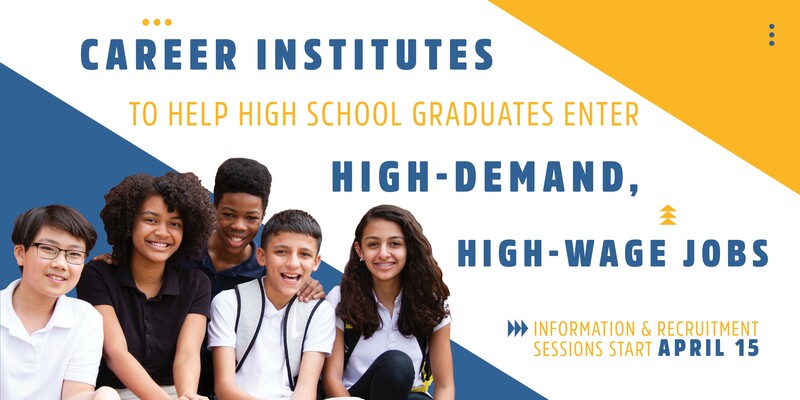 Starting April 15, Dallas ISD will host a dozen information/recruitment sessions to register interested eighth-graders. Families can go here to view the dates and locations of the sessions. Whatever path students choose, the career institutes will equip them to earn a living wage right out of high school plus financial literacy and entrepreneurship skills to help students succeed whether they join a company or start their own business. Alvarenga said the institutes are a response to the construction industry and families who have asked schools to increase vocational education options. “We created these career options because hard evidence shows they are needed,” he said. There is a high demand for those in skilled construction trades. The industry is offering entry-level salaries ranging from $14 to $20 per hour for high school graduates. Those with a certificate, associate degree or bachelor’s degree can earn double that amount. By some estimates, it’s projected that Dallas’ construction industry will need more than 300,000 construction and related tradesmen in future years.